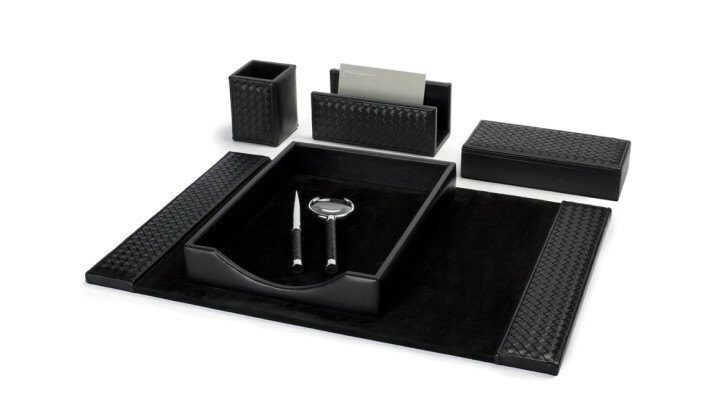 Ultra-soft leather is the material of choice for this luxury Italian desk set. The addition of suede and hand-stitched detailing is then used to bring texture to the practical accessories. Also available in grey with black suede, ivory with chocolate brown suede, taupe with chocolate brown suede and chocolate brown with chocolate brown suede. Desk Pad: Width 60cm x Depth 40cm Paper Tray: Width 24cm x Depth 32.5cm x Height 5.5cm Pen Cup: Diameter 8cm x Height 11cm Mail Holder: Width 21cm x Depth 10cm x Height 9cm Rectangular Box: Width 25cm x Depth 10cm x Height 5.5cm Letter Opener: Length 19cm Magnifying Glass: Length 22cm Available by order unless in stock. Delivery 6-12 weeks.